Yvonne Elliman is always on the move. In a business where female songsters are typed, tagged and filed, Yvonne Elliman has eluded being pigeon-holed and still comes out on top. 'I Don't Know How To Love Him.' Despite stiff competition from Helen Reddy (and others), Yvonne seems to be best remembered where this song is concerned. She followed with another song from the same source, 'Everything's Alright', which was conve-niently edited for single release omitting the vocals of Murray Head and Ian Gillan. she had with her first hits. From these later MCA recordings, it was her dynamic cover of The Who's 'I Can't Explain' that garnered the most attention. In 1975 she signed with Robert Stigwood's RSO Records. Steve Cropper, Booker T. & The MGs' guitarist extraordinaire was brought in to record Yvonne in Memphis for her RSO debut album, 'Rising Sun'. current top LP 'Children Of The World': 'Love Me' The Bee Gees were hot and her cover was outstanding and that combination put her in the top twenty once more. She followed with an LP named for the single from which her follow-up, a new version of Barbara Lewis' 'Hello Stranger', was pulled. The song found favor with fans as well. Perren did one more session for Elliman, and it was another Bee Gees song. This time it was commissioned for a soundtrack of a movie that had a Bee Gees written score. 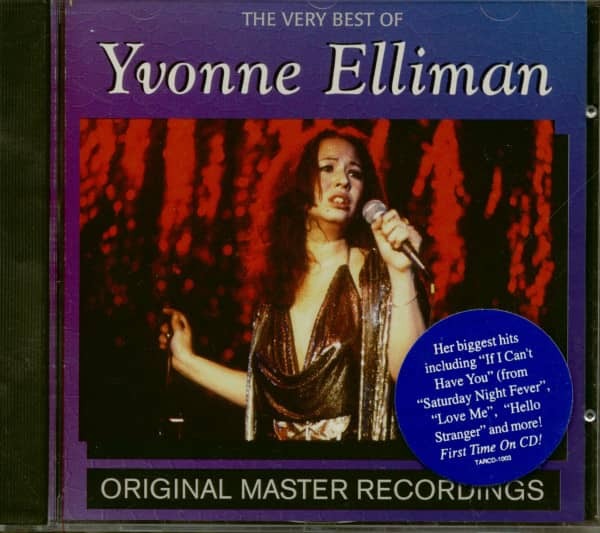 The movie was 'Saturday Night Fever' and, if people didn't know who Yvonne Elliman was before, they certainly knew now. The soundtrack stayed at #1 for 24 weeks and the single went to the top as well. With this soundtrack success, it wasn't long before another would come her way. The 'Moment By Moment' film would once again star John Travolta, this time sharing the bill with Lily Tomlin. Robert Appere produced the title song for Yvonne and another successful record was secured. Robert Appere would do her next two LP's, 'Night Flight' and 'Yvonne', but it was Steve Barri who would give her her next hit. 'Love Pains' was her last chart entry in 1979 and a special extended remix was done for a promo only 12" single. 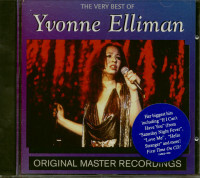 We've included this special rarity on this package and it cooks just fine, Yvonne Elliman has done pop, rock and disco and is comfortable doing them all. She is a versatile entertainer as one listen to this CD should prove. 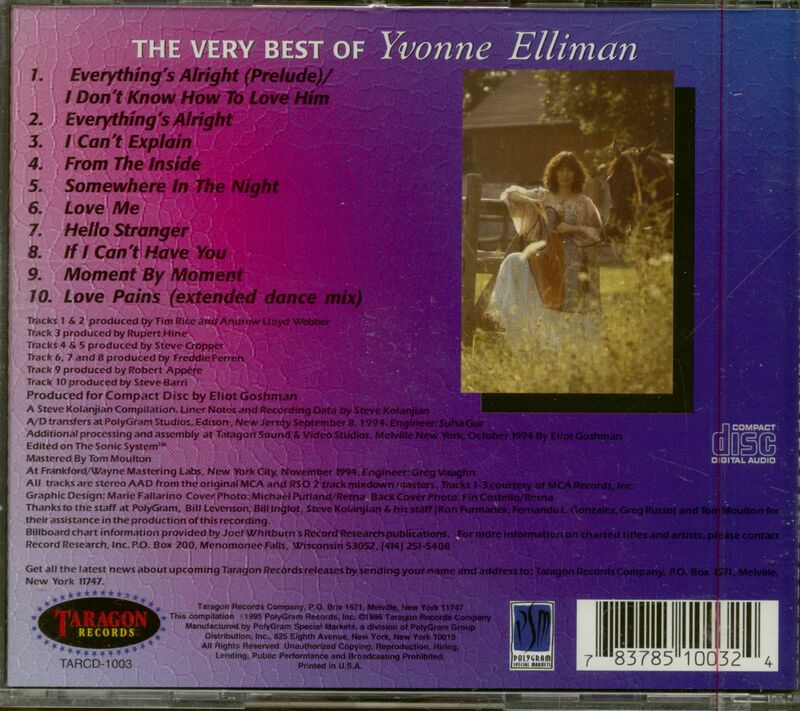 Sit down, lean back and enjoy The Very Best Of Yvonne Elliman. Customer evaluation for "The Very Best Of Yvonne Elliman (CD)"